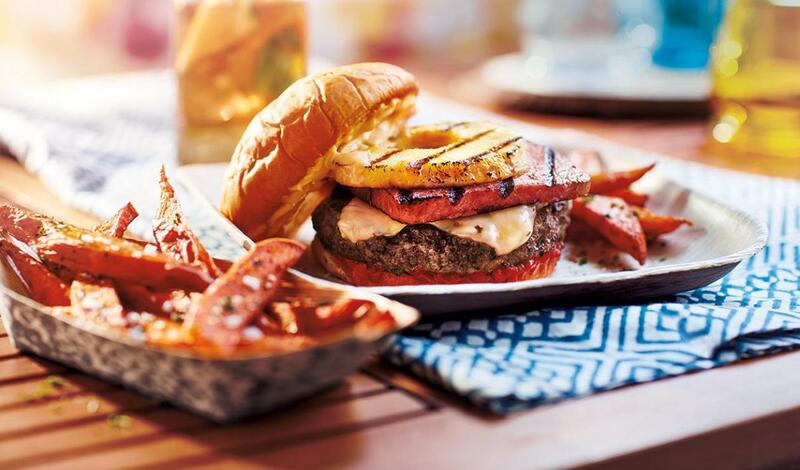 A ground beef and pork patty blend topped with pepper jack cheese, ham and pineapple, plus a sweet and spicy Hawaiian sauce made with Hellmann's® Real Mayonnaise. Combine all ingredients except Hellmann's® Real Mayonnaise and simmer until reduced by 1/3. Combine 1.75 cup of the reduction with Hellmann's® Real Mayonnaise. Reserve refrigerated. Combine ground beef and pork and form into 4 oz. patties. Cook patties through and top with cheese. Spread the Hawaiin sauce on each bun.